Seat type : Integrally moulded with the body. We have pleasure in introducing ourselves as a fast developing Industrial engineering organization. We supply industrial products like Ball Valves, Butterfly Valves, Hydraulics and Pneumatics product. Our global sourcing proficiency helps in all aspects of product quality, cost reduction, consistency of supplies and service. Wafer Butterfly Valve Manufacturers, Suppliers & Exporters in India. The Series 20/21 valve not only surpasses the high standards required in sanitary valve applications, and inherent flow characteristics and capabilities. Bray's Series 20 valve is a wafer version with flange locating holes, and the Series 21 is the companion lug version for dead-end service and other flange requirements. 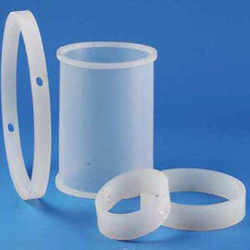 We are manufactures and supplies moulded elastomer Butterfly Valve Gaskets in sanitary. The material used meet the FDA standards for non toxicity, and range from neoprene, nitrile, silicone, EPDM, viton. We also offer rubber gasket for triclover clamps, din gaskets, SMS gasket, butterfly / iris valve gaskets and shifter gaskets etc.